Ana, a factory worker, has just arrived at work. She began noticing pain on her epigastric area while she was preparing for work at home. The pain has already progressed to her right lower quadrant when she arrived at work. She was brought to their company clinic and the nurse took her vital signs. She has a temperature of 37.7⁰C. The nurse palpated Ana’s left lower quadrant and she complained that the opposite side is painful. Ana was endorsed to the emergency room of a nearby hospital and was diagnosed with appendicitis. Any part of the lower GI tract is susceptible to acute inflammation caused by bacterial, viral, or fungal infections. Appendicitis (also known epityphlitis) is the inflammation of the appendix which is a small finger-like appendage attached to the cecum. The appendix is a small, finger-like appendage attached to the cecum just below the ileocecal valve. 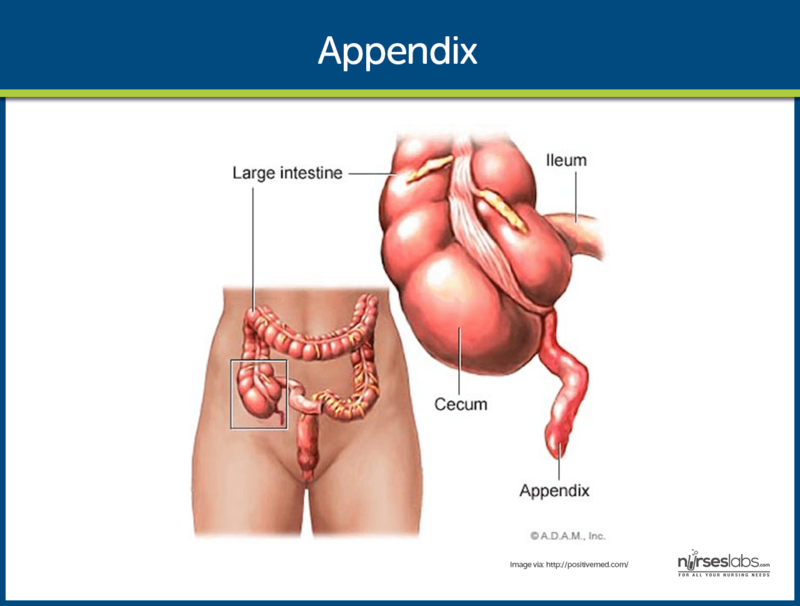 Because the appendix empties into the colon inefficiently and its lumen is small, it is prone to becoming obstructed and is vulnerable to infection (appendicitis). The simple pathophysiology of appendicitis follows the typical pathophysiology of infection. Obstruction. The appendix becomes inflamed and edematous as a result of becoming kinked or occluded by a fecalith, tumor, or foreign body. Inflammation. The inflammatory process increases intraluminal pressure, initiating a progressively severe, generalized, or periumbilical pain. Pain. The pain becomes localized to the right lower quadrant of the abdomen within a few hours. Pus formation. Eventually, the inflamed appendix fills with pus. Appendicitis is actually a common disorder in the United States. Appendicitis is the most common cause of acute surgical abdomen in the United States. It is the most common reason for emergency abdominal surgery in the United States. Appendicitis commonly occurs between the ages 10 and 30 years. Signs and symptoms of appendicitis are listed below. Pain. Vague epigastric or periumbilical pain progresses to right lower quadrant pain usually accompanied by low-grade fever, nausea,and sometimes vomiting. Tenderness. In 50% of presenting cases, local tenderness is elicited at McBurney’s point when pressure is applied. Rebound tenderness. Rebound tenderness or the production or intensification of pain when pressure is released. Rovsing’s sign. 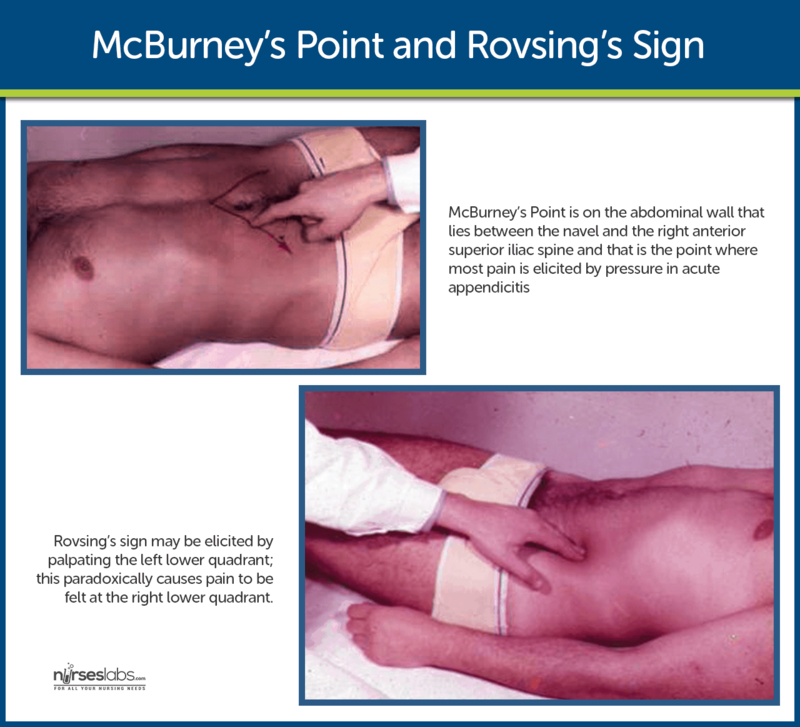 Rovsing’s sign may be elicited by palpating the left lower quadrant; this paradoxically causes pain to be felt at the right lower quadrant. If appendicitis is left untreated, a complication could occur. Perforation of the appendix. This is a major complication of appendicitis, which can lead to peritonitis, abscess formation, or portal pylephlebitis. Perforation generally occurs 24 hours after the onset of pain. Symptoms include a fever of 37.7⁰C or greater, a toxic appearance, and continued abdominal pain or tenderness. Diagnosis is based on the results of a complete physical examination and on laboratory findings and imaging studies. CBC count. A complete blood cell count shows an elevated WBC count, with an elevation of the neutrophils. Imaging studies. Abdominal x-ray films, ultrasound studies, and CT scans may reveal a right lower quadrant density or localized distention of the bowel. Pregnancy test. A pregnancy test may be performed for women of childbearing age to rule out ectopic pregnancy and before x-rays are obtained. Laparoscopy. A diagnostic laparoscopy may be used to rule out acute appendicitis in equivocal cases. C-reactive protein. Protein produced by the liver when bacterial infections occur and rapidly increases within the first 12 hours. Medical management should be performed carefully to avoid altering the presenting symptoms. IV fluids. To correct fluid and electrolyte imbalance and dehydration, IV fluids are administered prior to surgery. Antibiotic therapy. To prevent sepsis, antibiotics are administered until surgery is performed. Drainage. When perforation of the appendix occurs, an abscess may form and patient is initially treated with antibiotics and the surgeon may place a drain in the abscess. Immediate surgery is typically indicated if appendicitis is diagnosed. Appendectomy. Appendectomy or the surgical removal of the appendix is performed as soon as it is possible to decrease the risk of perforation. Laparotomy and laparoscopy. Both of these procedures are safe and effective in the treatment of appendicitis with perforation. A focus of the nurses’ management is the preparation of the patient for surgery. 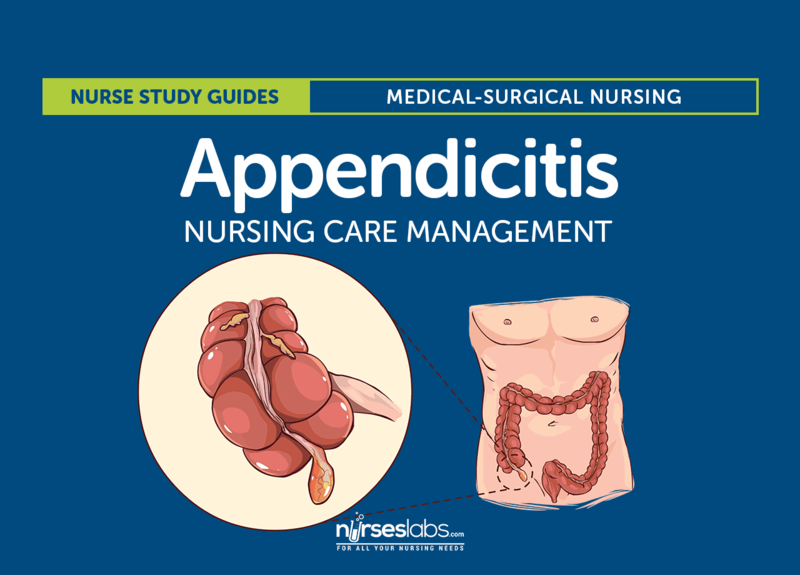 Assessment of a patient with appendicitis may be both objective and subjective. Assess the level of pain. Assess patient’s vital signs in preparation for surgery. Acute pain related to obstructed appendix. Risk for deficient fluid volume related to preoperative vomiting, postoperative restrictions. Risk for infection related to ruptured appendix. Eliminating infection due to the potential or actual disruption of the GI tract. The nurse prepares the patient for surgery. IV infusion. An IV infusion is made to replace fluid loss and promote adequate renal functioning. Antibiotic therapy. Antibiotic therapy is given to prevent infection. Positioning. After the surgery, the nurse places the patient on a High-fowler’s position to reduce the tension on the incision and abdominal organs, thereby reducing pain. Oral fluids. When tolerated, oral fluids could be administered. Eliminated infection due to the potential or actual disruption of the GI tract. Discharge teaching for patient and family is imperative. Removal of sutures. The nurse instructs the patient to make an appointment with the surgeon to remove the sutures between the 5th and 7th days after surgery. Activities. Heavy lifting is to be avoided postoperatively; however, normal activity can be resumed within 2 to 4 weeks. Home care. A home care nurse may be needed to assist with incision care and to monitor the patient for complications and wound healing. Client’s description of response to pain. B: Palpation of the left lower quadrant of a person's abdomen increases the pain felt in the right lower quadrant, the patient is said to have a positive Rovsing's sign and may have appendicitis. A: The right lower quadrant is not a site for palpation in appendicitis. C: The right upper quadrant is not a site for palpation in appendicitis. D: The left upper quadrant is not a site for palpation in appendicitis. C: Thrombocytopenia could not be found in a patient with appendicitis. A: A low-grade fever is a symptom of appendicitis. B: Abdominal tenderness on palpation is a symptom of appendicitis. D: Vomiting is a symptom of appendicitis. C: McBurney’s point is found at the right lower quadrant. A: McBurney’s point is not found in the left lower quadrant. B: McBurney’s point is not found in the left upper quadrant. D: McBurney’s point is not found in the right upper quadrant. Increased abdominal pain when coughing. A: A positive Rovsing’s sign is a symptom of appendicitis. B: Abdominal pain is felt only when there is a release of pressure. C: Tenderness is felt at the right lower quadrant. D: Not all of the options are correct. Salicylates to lower an elevated temperature. D: All of the interventions are appropriate for preparation for appendectomy. A: An IV infusion is made to replace fluid loss and promote adequate renal functioning. B: Antibiotic therapy is given to prevent infection. C: Fever is a sign of infection, therefore, it must be treated to stabilize the vital signs and eliminate infection. B. Abdominal tenderness on palpation. A. A positive Rovsing’s sign. B. Increased abdominal pain when coughing. C. Tenderness around the umbilicus. C. Salicylates to lower an elevated temperature. 1. Answer: B. Left lower quadrant. B: Palpation of the left lower quadrant of a person’s abdomen increases the pain felt in the right lower quadrant, the patient is said to have a positive Rovsing’s sign and may have appendicitis. A: The right lower quadrant is not a site for palpation in appendicitis. C: The right upper quadrant is not a site for palpation in appendicitis. D: The left upper quadrant is not a site for palpation in appendicitis. C: Thrombocytopenia could not be found in a patient with appendicitis. A: A low-grade fever is a symptom of appendicitis. B: Abdominal tenderness on palpation is a symptom of appendicitis. D: Vomiting is a symptom of appendicitis. 3. Answer: C. Right lower quadrant. C: McBurney’s point is found at the right lower quadrant. A: McBurney’s point is not found in the left lower quadrant. B: McBurney’s point is not found in the left upper quadrant. D: McBurney’s point is not found in the right upper quadrant. 4. Answer: A. A positive Rovsing’s sign. A: A positive Rovsing’s sign is a symptom of appendicitis. B: Abdominal pain is felt only when there is a release of pressure. C: Tenderness is felt at the right lower quadrant. D: All of the interventions are appropriate for preparation for appendectomy. A: An IV infusion is made to replace fluid loss and promote adequate renal functioning. B: Antibiotic therapy is given to prevent infection. C: Fever is a sign of infection, therefore, it must be treated to stabilize the vital signs and eliminate infection.